Did you know today is National Martini Day? I did not until recently but I’ve got a cocktail worth celebrating with so how could I even think of missing this day (even if a bit late). The martini’s rich American history is deserving of a toast – the cocktail dates back to the 1860s but its true origin is debated. One theory suggests it evolved from a cocktail called the “Martinez” served in the early 1860s in San Francisco, named after the nearby town of Martinez. Another theory links its creation to a NYC bartender named Martini di Arma di Taggia who served the cocktail in 1911 at the Knickerbocker Hotel. Regardless of its origin, the martini quickly gained a strong and famed following including John D. Rockefeller, James Bond, Humphrey Bogart, Franklin D. Roosevelt, Clark Gable and Ernest Hemingway. The popularity of vodka martinis are on the rise. While some, neigh many, might decry even calling a cocktail that consists of other than gin and vermouth a martini, I get it. I know several people who just can not stand the juniper component of gin, hence they ‘hate gin’ but given the option of vodka it’s a different story. It’s the biting, bracing cold of the drink they love and yes, maybe the element of sophistication that few other drinks bring to the literal table. Although I love a gin and tonic in the summer, I am most definitely a ‘vodka martini’ type and I like them simple, nothing dirty for me and if truth were told, it’s not the first cocktail I’m going to order, never has been. This one has changed my mind, the Grey Goose VX Martini Exceptionnelle. Let me tell you why. It’s the Cognac! When the good people at Grey Goose invited me to sample this new product I was told it was best served ice cold and straight up. It’s not the only cocktail served that way but for me, there would be little point in my posting about it, don’t you agree? Here’s the recipe. Stir with ice and strain into a chilled glass. I’m sure that would be not only disappointing for you but not much fun for me either; I love the making of the cocktail and the discovery of something new and fabulous by combining ingredients that I might not have considered before…and boy does this Grey Goose VX Martini Exceptionnelle do just that! With GREY GOOSE VX, the French brand that launched a vodka empire, is literally turning to its wine roots. The new VX is made with a small measure of precious cognac, resulting in a luxurious new ultra-premium hybrid vodka that goes straight to the French heart of GREY GOOSE. 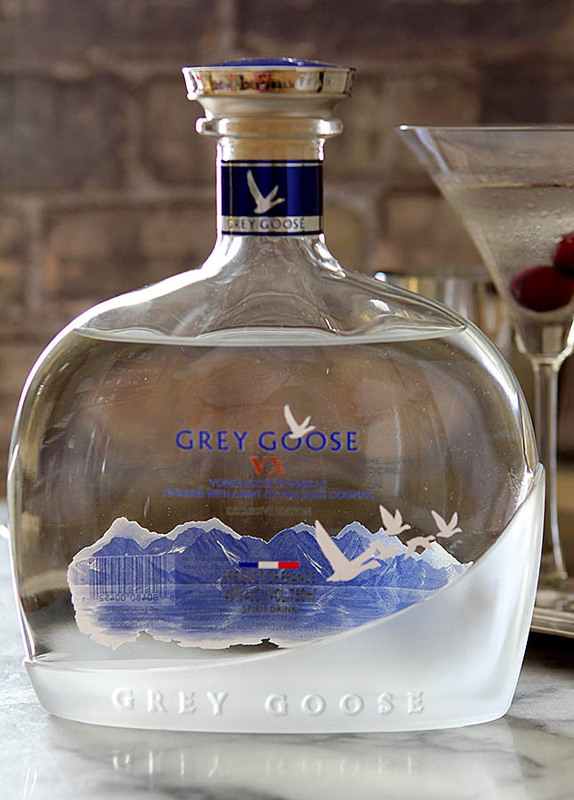 Not really all that surprising as it was cognac expert Francois Thibault who created the original recipe for Grey Goose which is distilled using French wheat and bottled in Cognac, France. Thibault brought his cognac making experience to the forefront again and crafted GREY GOOSE VX (“vodka exceptionnelle”) using eau de vies from grapes exclusively from Grande Champagne, the highest-quality cru in southwestern France. The eau de vie is distilled and then barrel aged for two years before it is blended with Grey Goose. The blend contains about 5 percent cognac, but it’s enough to impart a cognac nose and distinctive cognac flavors without edging out the vodka experience too far. 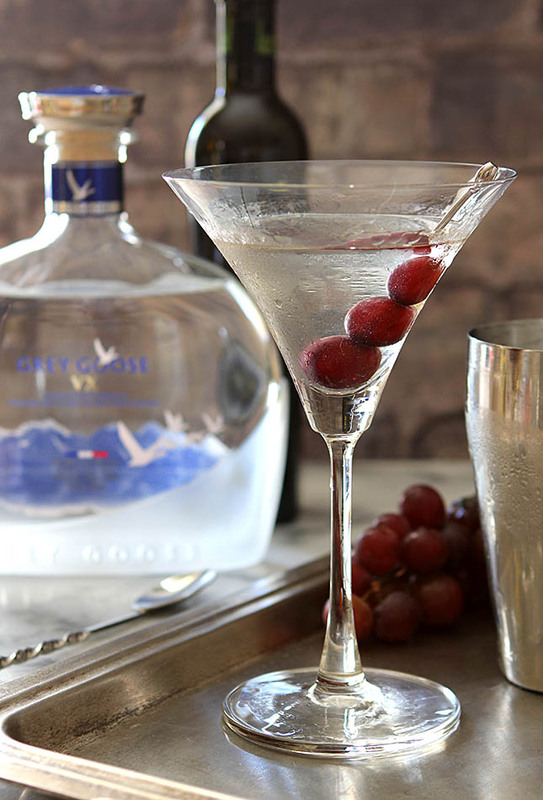 The tasting notes of GREY GOOSE VX include hints of white fruit blossom, plum, apricot, light citrus and wild honey, followed by a long, lingering finish. I tasted some straight and it’s subtle but also amazing. Vodka is well known for being odorless, colorless and sometimes almost tasteless but not with the GREY GOOSE XV; the cognac maybe be subtle but adds a wonderful richness that is quite evident. Through some discovery I learned that there was a new signature cocktail that was unveiled exclusively during the festival at the Grey Goose Blue Door. 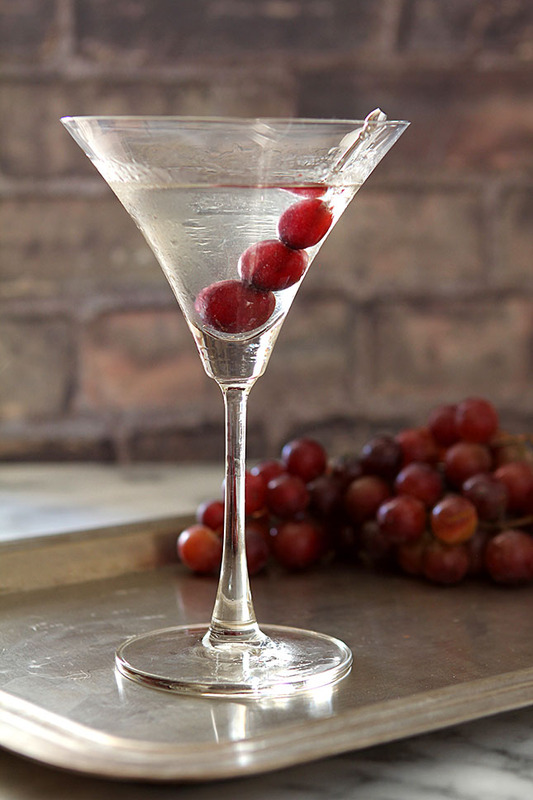 A luxurious spin on a classic martini cocktail, the Martini Exceptionnelle is served in a chilled martini cocktail glass first rinsed with Absinthe, then finished with a spritz of honey water and garnished with frozen grapes – so unique and so simply beautiful. Thankfully I had some absinthe on hand and believe it or not the honey water was my biggest challenge. Not the making of it but the spritzing of it! I finally gave up on finding a bottle in my home that I could use so resorted to literally spraying it on with my fingertips. It worked…that subtle taste was hinted at from the first sip. This is sophistication in a glass. Not something for Dad to gulp down on Sunday with the Canyon Creek Burger I shared yesterday but maybe beforehand? Give him a bottle of XV and while he’s got his feet up, prepare him one of these to sip on. Now that would be special. Here’s to National Martini Day and even more, to all the good dads and granddads that we honor on Sunday. Cheers! Chill a martini glass in the freezer for at least 15 minutes. Rinse the inside of glass with absinthe. Pour VX over ice in a cocktail shaker and stir until ice cold; strain into the prepared martini glass. Spray honey water into glass. Garnish with frozen grapes on a skewer. What a beautiful looking drink! I bet it is amazingly refreshing and perfect for summer! Thanks for the great ideas! It was a superb cocktail and so pretty too! This martini sounds fabulous-and strong! The frozen grapes are such a nice touch. The absinthe rinse would be just enough. I remember buying a bunch of absinthe when we were in Prague. Just because we could. Very stout stuff. I’ll be on the lookout for Grey Goose VX. And tell me – what does one do with the Absinthe Rinse? Toss it or drink it? I rinsed the inside of the glass and then the bit extra left in the glass I just poured back into the bottle. It’s pricey stuff…have to conserve! I must admit I do like gin in a martini, particularly because I also like a healthy slug of dry vermouth in it (I usually mix mine 4:1). And IMO vodka doesn’t mix all that well with vermouth — but you’ve solved that! The absinthe rinse is brilliant. Really brilliant — love the idea. Really creative — thanks.